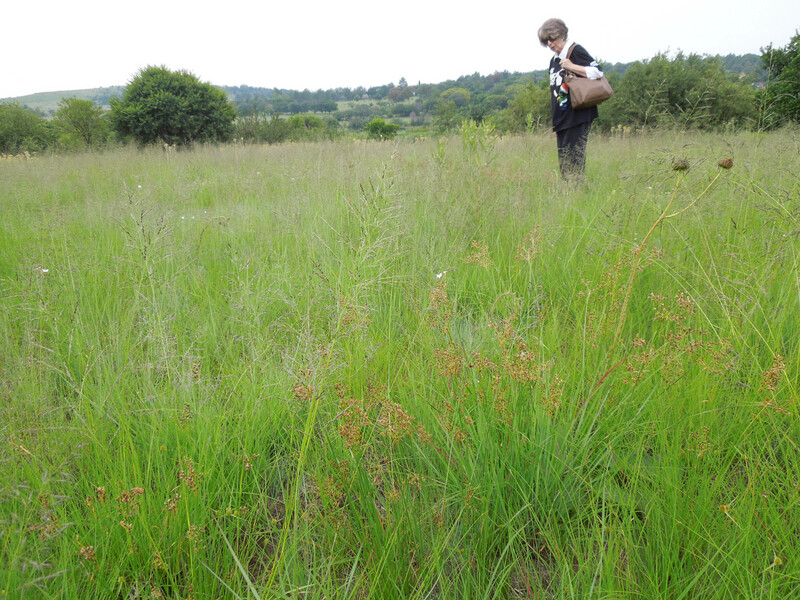 During a recent visit to Random Harvest Nursery I had the privilege of visiting a restored grassland. About 25 years ago this piece of the farm was a dense stand of alien invasive Black and Silver Wattles. Linda de Luca and her mother decided to remove the forest and allow the grass to re establish itself, initially for grazing purposes. 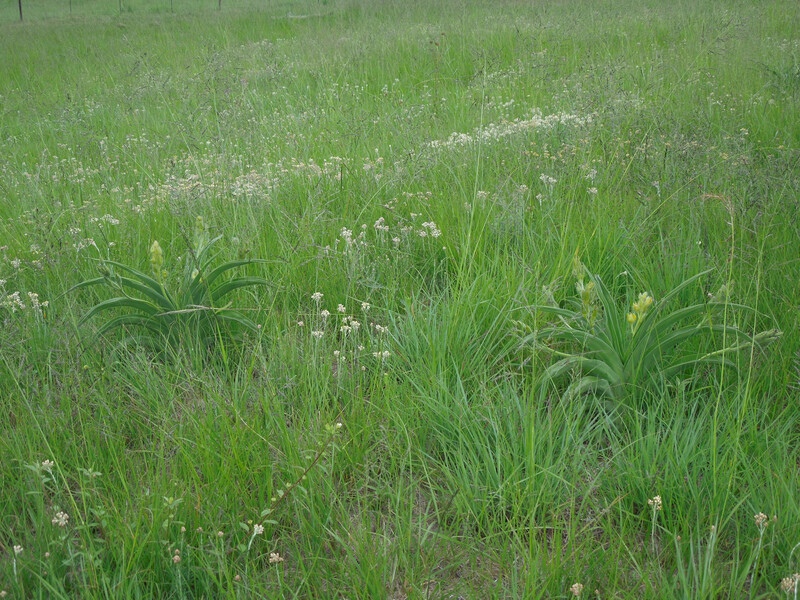 Then about 12 years ago, their interest in grassland deepened and they decided to play a more active role in restoring the grassland. 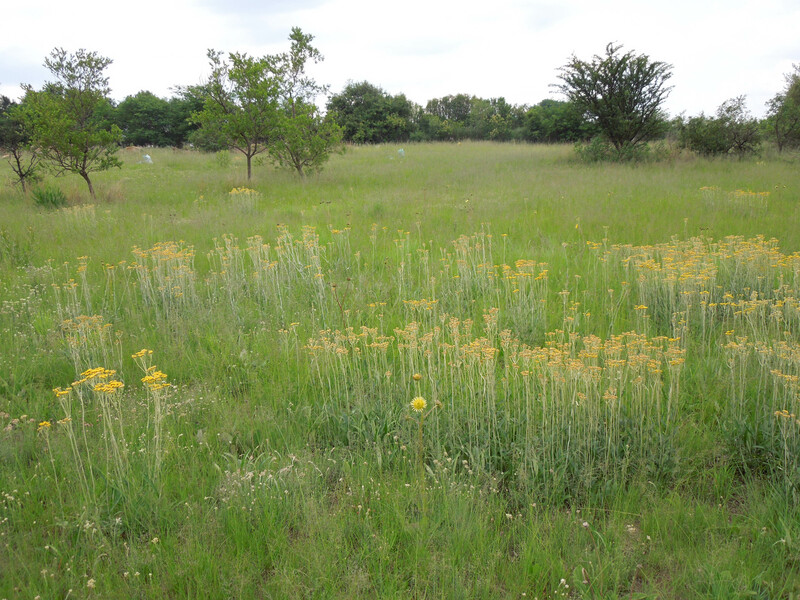 The result is spectacular: a little piece of climax high veld grassland in the heart of Gauteng, and only a stone's throw from the bustling centre of Johannesburg. It was an overcast day after a few days of rain - the grasses were lush green and flowering, in their prime. Eragrostis curvula, Eragrostis capensis (heart love grass) and Themeda triandra (red grass) were a few that I could name. 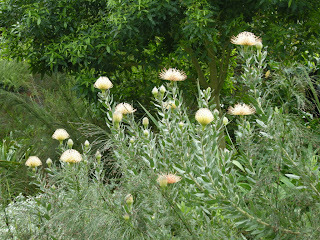 in this matrix of finely textured green were splashes of yellow Helichysum, and the striking tall inflorescenes of prickly Berkheya. 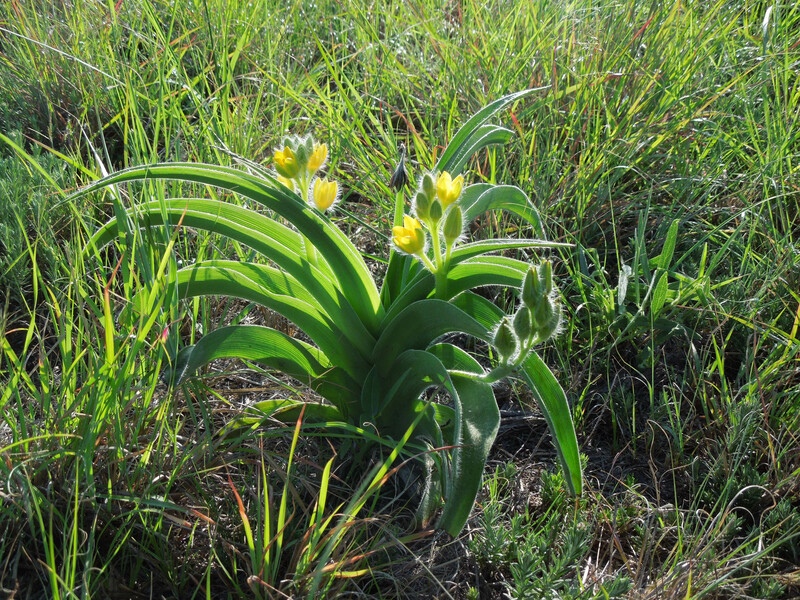 I was lucky to have Carol Knoll as my guide - she had just published an excellent article on the restoration of this grassland in Footprint Limited magazine. As we walked through the grassland, we were like kids in a candy shop, excitedly pointing out little herbaceous gems under our feet. Carol showed me how the Milkwort was alive with insect activity - ants, beetles and of course butterfly pollinators. The star flowers remained firmly closed, in the absence of sun, but below is a picture I took in the same grassland last year. 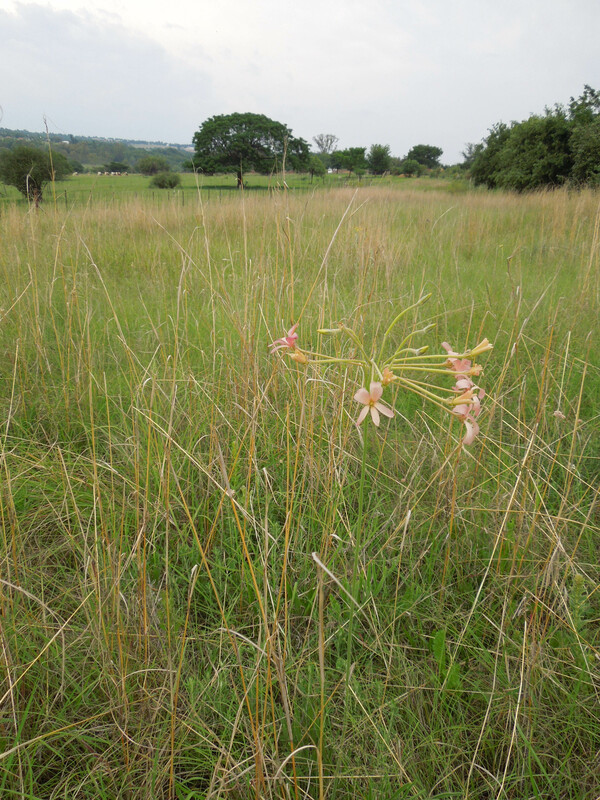 As we left the restored grassland, I saw a dense stand of Hyparrhenia hirta and wondered how this local but weedy invasive species was kept in check? I found the answer in Carol's article which describes how the Hyparrhenia was cut and removed before it seeded, and used to make compost for the nursery. 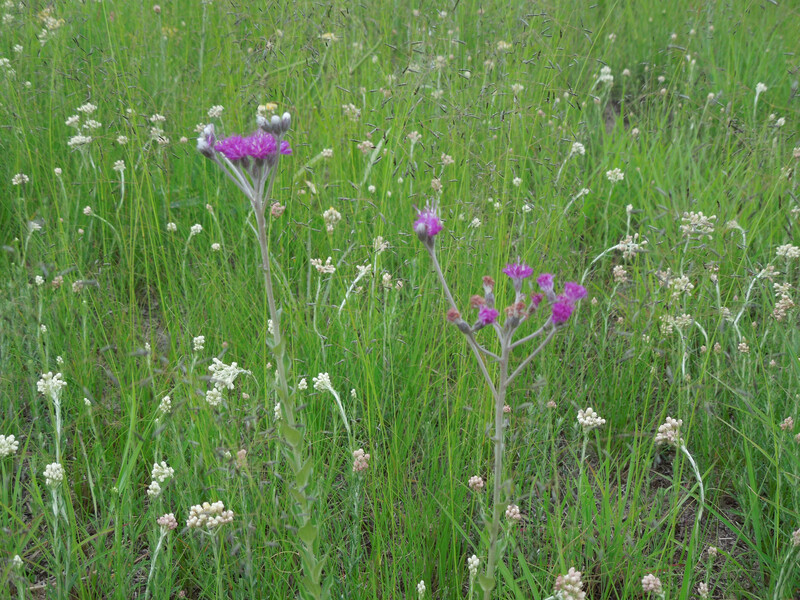 In addition, the grassland is regularly weeded to remove pompom weed, tall verbena and Plantago. To increase biodiversity and provide different conditions, the grassland is burnt every 3 years, and slashed annually, with one third slashed in autumn (March), one third in spring and the remainder left untouched. Quite a regime, but it has yielded excellent results. 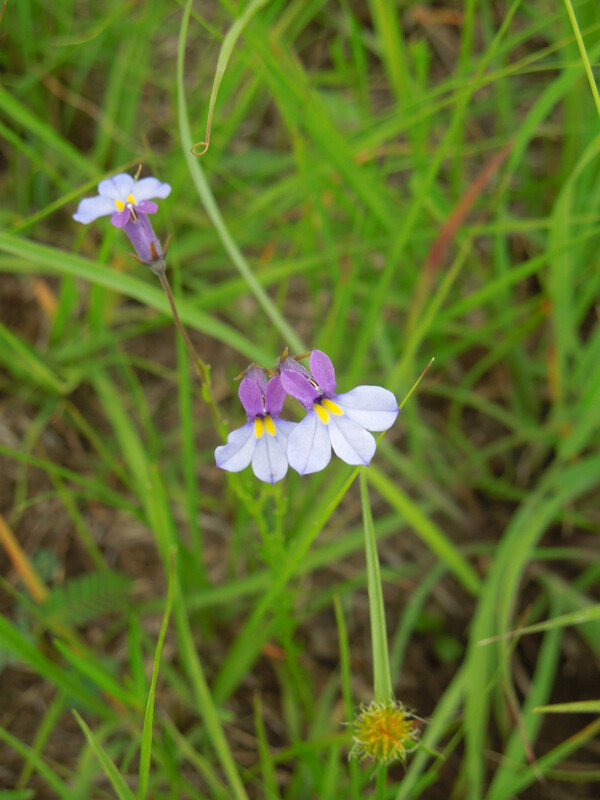 In addition to the spectacular increase in plant diversity, the restored grassland has provided a habitat for the Giant bullfrog and many species of butterfly, including the Eyed Pansy. As I left - in great haste - to catch my plane at Lanseria airport I spotted a Waving pelargonium - a fitting end to my grassland visit. Spring has sprung in the Biodiversity Garden at Green Point Park. Parts of the garden are awash with colour, such as the 'Hybrids and cultivars' display seen below. I like the way the 'Invasive plants' display has turned out, with the rare and endangered Strawberry Spiderhead crowded out by statuesque invasives. This is what the same planting looked like in December 2010. Notice how the coastal thicket in the background has effectively screened the lawn display - the thicket is now about 2m high. The 'Shade Dome' is still looking stark and err... where is the shade? The fast-growing Forest Pea (Dipogon lignosus) which raced to the top and looked so promising last year, is now bare at the base, and looking untidy with a lot of dead material on the frame. The Wild Grape (Rhoicissus digitata) is the trust-worthy long-term solution, but growing very slowly. Too much competition, perhaps. I've asked the area around the base of the climbers to be cleared. The Hedge display is looking good enough. The Confetti Bush (Coleonema album) and Grewia robusta are thriving, but unfortunately it's too wet for the grey Beach Sage (Salvia africana-lutea) which has died back in places. We will replace it with Rhus glauca (Blue Kuni-bush) which also has greyish leaves. One of the challenges of gardening in the Biodiversity Garden is the heavy clay soil and high water table. In fact the Green Point Park area used to be a seasonal wetland, and sailing regattas were held here! Clay soil dredged from the harbour (now the V&A Waterfront) was brought in to create sportfields and recreational amenities in the 1900s. A life ring has been installed right in the framed view of the fish - what a pity. I understand safety comes first but aesthetically it's plain awful. Blogger, Google - what have you done? I am sad to see that all the images are missing on this blog. No response from Google, no explanation. I started reloading the images, but for 71 posts spanning 3 years it's just not feasible. My apologies. And of course if anyone can help....? Aren't these just yum? 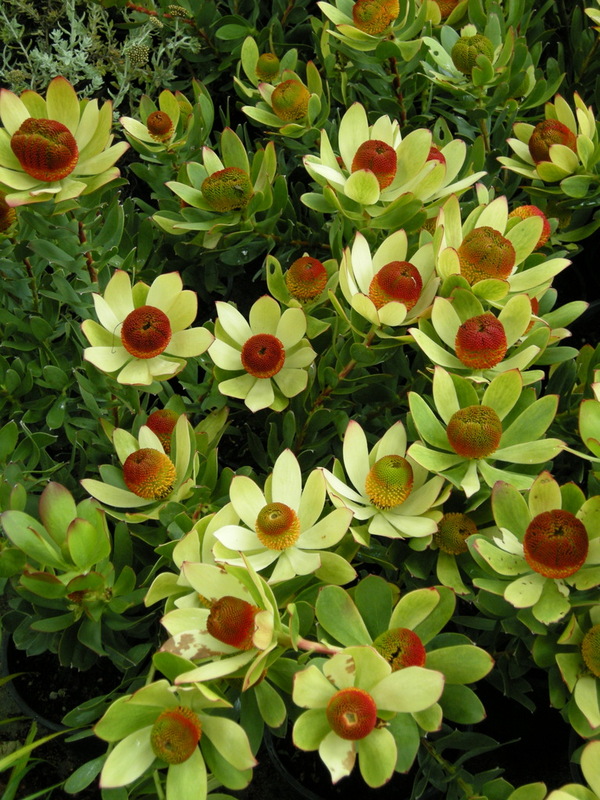 It's a hybrid of Leucadendron called 'Summer Sun'. I had ordered a wide variety of fynbos for a farm landscape outside Caledon (Western Cape), and of all the plants standing in my driveway, this one was my favourite. 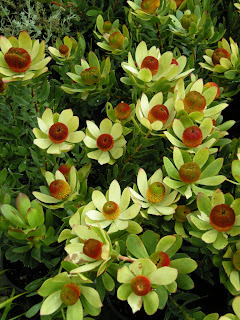 Summer Sun is a hybrid between Leucadendron laureolum and a Peninsula endemic, L.strobilinum. 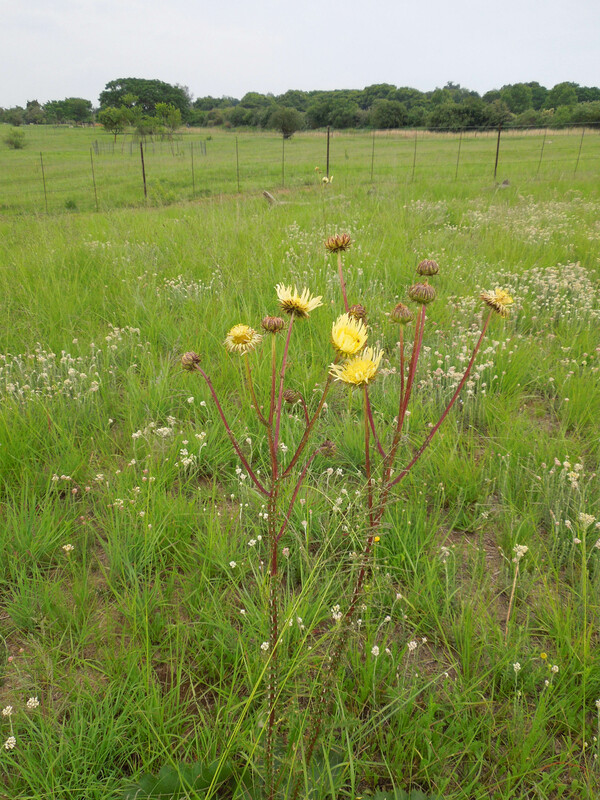 They are adapted to winter rainfall and nutrient poor soils. 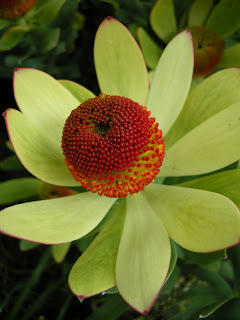 If you live in SA and just have to have Summer Sun in your garden, you can get plants from Arnelia. Remember they require well-drained acidic soil. You can compost / mulch the plants, but no phosphorous, and remember it's best to plant in autumn or winter. This magnificent Fan Aloe (Aloe plicatelis) is flowering in a garden in Muizenberg. 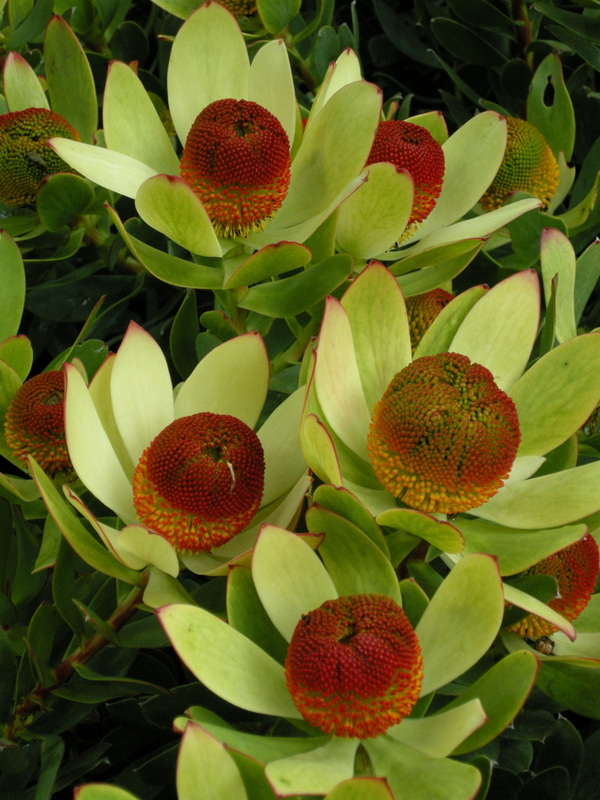 Although it is a true fynbos species - occurring only on Table Mountain sandstone soils, in fynbos areas - it is not native to the Cape Peninsula. Which means this one was planted. I wonder who planted it, and when? 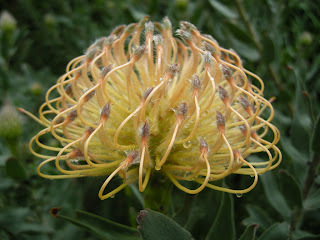 This year I have my first show of Leucospermum 'Spider' in my garden. 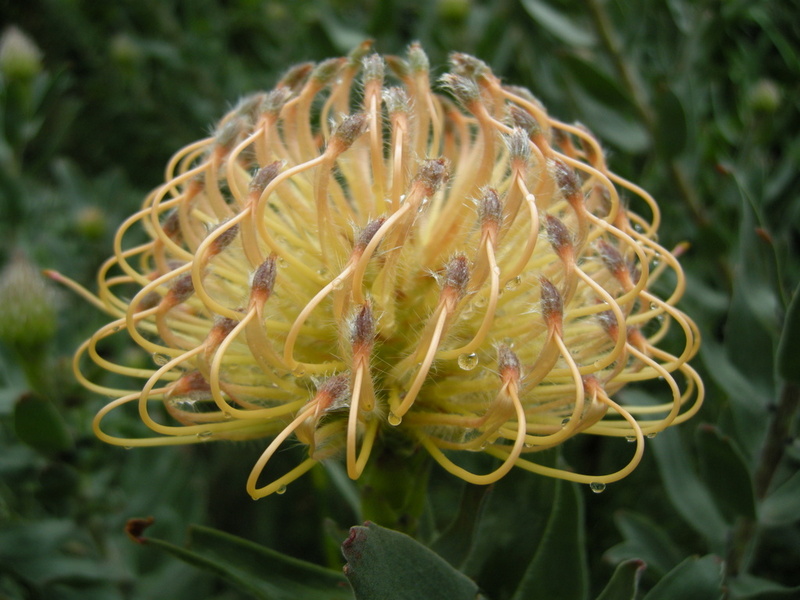 It's a hybrid of Leucospermum tottum with typical grey-green leaves and salmon-pink flowers. I think the flowers are breath-taking - can't get enough of them! The Mountain Aloe (Aloe arborescens) is in full swing. Bright red torches of Aloe succotrina in the Mountain Fynbos section. 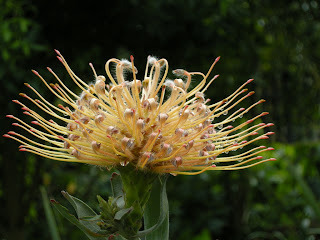 This aloe species is a fynbos endemic - usually found in rocky areas or scree slopes. Daisies such as Arctotis and Osteospermum are in full bloom. 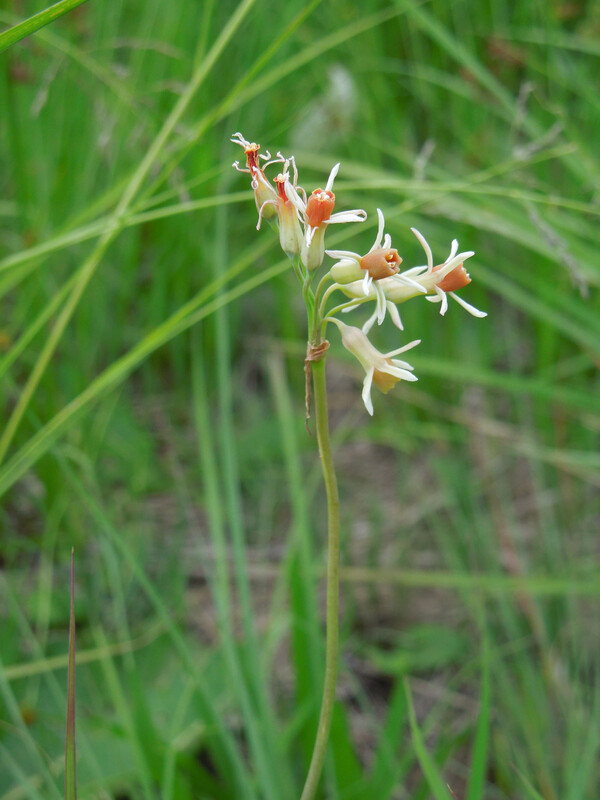 Jordaniella dubia in the Strandveld section. Lachenalia reflexa in the Lowland Fynbos section. I was surprised to see this diminuitive plant on the Alert List for Environmental Weeds in Australia. "Yellow Soldier was first recorded as naturalised south of Perth, Western Australia, in 1957, probably after escaping from a garden planting. It has since become a problem weed and is spreading through tuart (Eucalyptus gomphocephala) and banksia woodlands". Plakkie or Pig's Ears (Cotyledon orbiculata) are flowering now. The newly planted Coleonema album hedge in the Hedging display area. Restios, grasses and aloes in the Mountain Fynbos display. 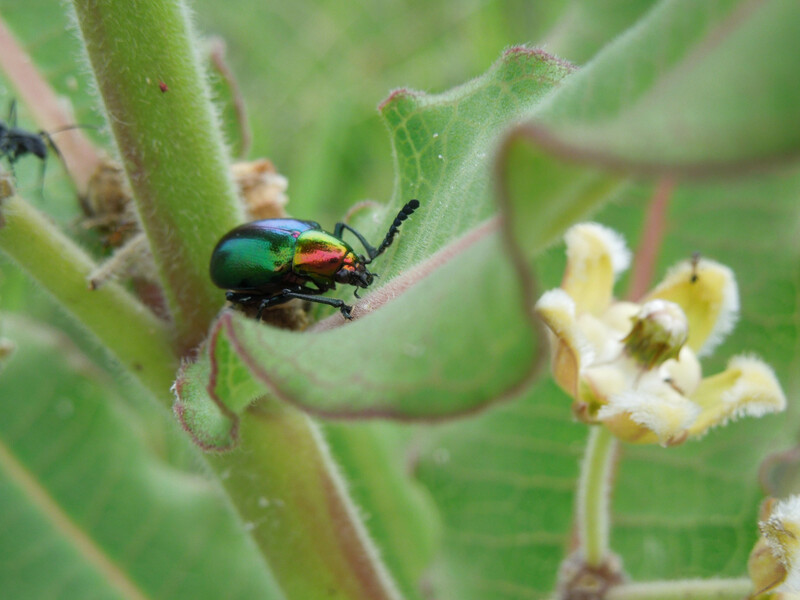 The Biodiversity blog has moved! The Biodiversity Showcase Garden is situated in the new Green Point Park in Cape Town. It features over 300 local Cape plant species, animal sculptures, interactive displays, demonstration gardens, a Khoikhoi display and more. The aim is to educate and inspire visitors to enjoy and value biodiversity. For more info visit Backtracking. Unfortunately Blogger/Google has 'lost' all the images, so most of the older posts are just text. Text & photos: Marijke Honig 2010. Powered by Blogger.